The TracerPlus Mobile Client allows you to import and export text files which works well for some, however we find that most businesses need complete control of how and where data comes from. Because of this, PTS offers the all-in-one syncing tool, TracerPlus Connect. TracerPlus Connect allows organizations of any size to sync data in batch, wireless or real-time to most ODBC Databases, Excel Workbooks and Text files. Sync via USB Cradle/Cable (Windows Mobile/CE only), Ethernet Cradle/Dongle, WiFi and WAN in Batch or real-time. Setup timed syncs for automated data syncing or add conditions to limit when data can be synced. Sync with ODBC databases including SQL Server, MySQL, Oracle, MS Access and most other ODBC Compliant databases. Sync to multiple Excel workbooks & sheets or plain Text files. Sync your mobile data to and from ODBC databases including SQL Server, MySQL, Oracle, MS Access and many more. Sync your mobile data to and from Microsoft Excel sheets & workbooks, CSV files and plain Text Files. Sync your mobile data to and from Salesforce. Sync your mobile data via cradle or cable connected to a PC. Sync your mobile data wirelessly or in real-time via Wi-Fi/Cellular to the PC or server of your choice. 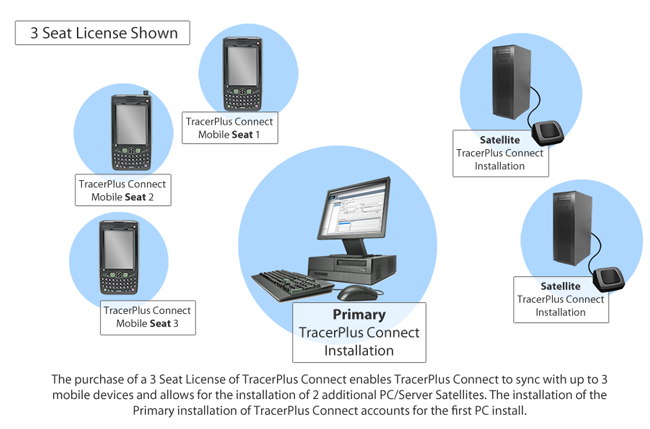 TracerPlus Connect is offered in 1, 5 and 10 packs for your convenience and can be purchased below. Looking for a different quantity? Call us with questions. TracerPlus Desktop allows users and organizations of any size to create custom mobile applications for mobile devices, barcode terminals, RFID scanners, smartphones and tablets running Windows Mobile, CE and Android OS's. System Requirements: Windows 2000/XP/Vista/7/8/10; Windows Server 2003/2008/2012/2016; 50 MB free disk space; Windows Mobile/CE devices require ActiveSync version 3.5 or higher (2000/XP) or Windows Mobile Device Center (Vista/7/8/10) for USB syncing. A Mobile Device running Android, iOS, Windows Embedded Handheld/CE or Windows Mobile/CE OS; Trial or registered version of the TracerPlus Mobile Client; Microsoft Excel 2000 or Greater for transfer to Excel. ODBC compliant database (i.e. Access, Oracle, MySQL and SQL Server among others) for ODBC syncing. Compatibility: Version numbers of TracerPlus Connect must match version numbers of TracerPlus Desktop and the TracerPlus mobile client for interoperability.